Nights are getting cold, enough to leave black drooping leaves on more warm-loving crops like basil. We've still been enjoying lovely 60-80 degree weather during the day though. 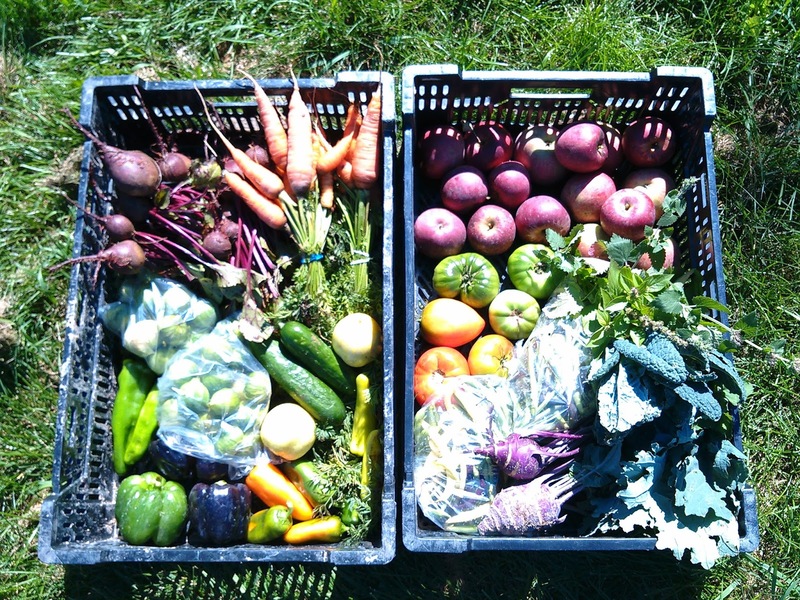 This week we have some fall favorites: Apples, beets, and carrots, as well as a welcome surprise, a return of tomatoes! We harvested all the large green tomatoes from our plants in the greenhouse last week before we tore out the sickly plants. The fruit have lasted quite nicely, some even ripening. So this week we get a mix of two seasons, the end of summer and the bounty of fall. Unfortunately, looking through our field, some of our winter squash like butternut and spaghetti squash did not do well this year, so we won't be seeing them until next fall. New this week we have apples from our orchard. Small Produce shareholders should have enough this week to make an apple pie or just to snack on. A spring and fall favorite for some, for others beets can be more of an acquired taste. Roast 'em, fry 'em, grate 'em! There are many recipes for you to try to come to know and enjoy beets. Another spring and fall favorite, try these roasted, in soups, raw in salads. There are as many options with carrots as you can imagine! We picked the largest green tomatoes from our greenhouse tomatoes before we tore them out. They have held up well this week, some of them even turning! So enjoy these pickled or fried! We picked the largest green tomatoes from our greenhouse tomatoes before we tore them out. They have held up well and some have even turned, so surprise! One last week of tomatoes. Try making kale chips, or sautéing them in olive oil, garlic, salt and pepper and a dash of cayenne. Or have a raw a kale salad with shredded beets and carrots. You can't go wrong. This week we have bell peppers, jalapeno, anaheim, sweet snacking peppers, and hugarian wax peppers for everyone. The cucumbers in the greenhouse are beginning to succumb to downy mildew, so enjoy these now, we won't have them much longer! This may be our last week of cucumbers, which is unfortunate because greens will be starting again. We like to eat the lemon cucumbers raw, like an apple, but they can be pickled or used in salad or cucumber salad just like any regular cucumber. This week we have lemon basil, citrus mint, and catnip for everyone.